A couple of posts have made the national blogs today about this. On the North Carolina ballot, voters have the option of voting a "straight party ticket." Note that if you choose to vote a straight party ticket, that does NOT count as a vote for President, which is above the straight party vote, or for judges, who are on the back of the ballot. Poll workers and volunteers should inform people of this, but some new voters might miss this difference. Now go vote early. If someone seems confused, mention this or show them to a poll worker. That at one polling place, voters were instructed, supposedly by pollworkers (trying to verify that now) that they should fill in the oval next to the D or the R, and then flip the sheet over and vote for the judges and the Board of Ed folks. The problem was that they weren't told that they could vote individually for each race, nor were they told that they *had* to vote separately for President. Also, the gentleman running against our Republican District Attorney is Unaffiliated, so they missed voting for him if they wanted to. I have heard from two separate people that this happened, and neither of the two people had spoken to each other. I am going to call the BOE tomorrow and find out what they have to say. a couple weeks ago, and alerted my regional Obama organizer. I had to have several people unseal their absentee ballot and fill in the Prez section. I'm telling you this is going to be a bigger issue than we think. I urge everyone to keep this in mind in our GOTV efforts and at polling places. Thanks for posting this TG. While I was in line for early voting at the Morehead Planetarium today, I was told by two people that I needed to vote for the president even if I did straight ticket. Even the woman who handed me my ballot told me. Here they're making sure that everybody knows. I hope that this is going on around the rest of the state. There is a YouTube on the "Obama Straight Flip" - vote Obama, then straight party, then flip the ballot to vote the non-partisan judges. I also heard it at Morehead Planetarium, and there were signs up explaining it. Problem there is that students had their heads in books all the way to the poll worker. It only takes a second to ask people you meet if they have voted yet, and to give them a reminder on voting separately for President. I told the guy at the local dump yesterday when I took my trash. The word can get out quickly if everyone just tells a couple of others. You can get a sample ballot from the State Board of Elections website at the Voter Lookup page. Here's a link to a sample ballot for my district in Wake County. candidates of that party in partisan offices. party in any individual office. order for your vote to count. It's all written small and hard to read especially if you are trying to make sense of the whole ballot. Go to the Voter Lookup page and get your own sample ballot. we run into the issue of very low literacy. I know they are not going to read the ballot before they go in. On Election Day, when I'll be at the polls, I'll have several sample ballots outside for people to look at and to explain it to them. All we can do is our best to educate. I don't expect most people to read the small print even if they can. 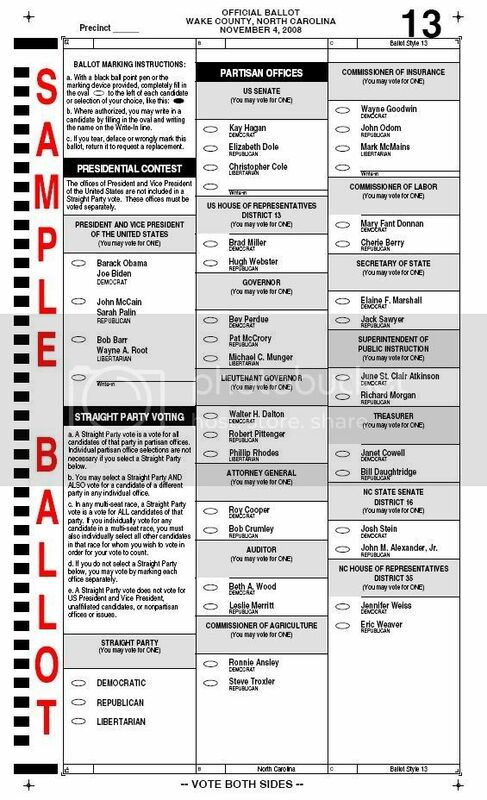 The sample ballot is great for familiarizing people with the visual format beforehand. Poll workers are essential for explaining. The woman who instructed me did an excellent job. She was very thorough. She went through step-by-step and was clear about the fact that I had to vote for president separately if I planned to vote straight party. She also stated that I didn't not have to vote straight party and she told me straight party did not cover the non-partisan races. The UCNCDP (our county party) and the Democratic Women of Union County are taking out ads and full page inserts describing the voting procedures. to explain the ballot, she did not offer to tell me that I had to vote seperately for judges or President if I voted straight ticket. I wrote about my visit and sent it to everyone in my email address book. Please oh please, everyone either write your own letter or copy pasta Tar Gator's article above and a few of the comments here and send them to everyone in your email address book. The Orange Co. Democratic Party has two greeters at each early voting site all the time. I have worked two shifts now at the new EV site at the Northern Human Services Center in Cedar Grove. I ask voters if they want a Democratic Party sample ballot and if they do, I explain to them that they MUST vote first for President, then they CAN vote a straight ticket (which I gently encourage) OR choose their candidates in the individual races and then flip it over and vote for the the judges ("Obama, Straight, Flip"). I tell them they can take the sample ballot with them and use it as a guide when they are actually voting. Finally, I ask them to bring back the sample ballot so we can recycle it or better yet, bring it home for a voter who hasn't voted yet. I've told everyone I know to just completely skip the Straight Ticket option. Completely. I've never trusted that it actually counts all the lower races correctly anyways. I tell everyone to just go through and vote each and every Democrat by name. It's worth the extra two minutes of marking just to make sure everything counts!! We're doing the straight flip in Orange. The scanners we use are shown to not drop votes and there is a hand count afterwards from what I understand. In addition, all the seats have democrats running. in my precinct with the Obama-Straight-Flip information on one side and the locations, dates, and times of early voting on the other. I also sent this postcard to all the Dem voters who only go to the polls during general elections. Several people called me already telling me how much it has helped them in early voting. I will also display a huge sign outside the precinct's polling place on Nov. 4 calling attention to this issue along with handing out voter guides and answering questions. I urge anyone concerned about this problem to sign up to volunteer as a greeter at early voting sites in your county and at your precinct on Nov. 4 so that you can educate as many voters as possible. It's our hands to keep undervotes as low as possible. How many folks study all the races? Most folks have not researched the candidates running for say, State Treasurer. There is nothing wrong in this case of voting for the person of the party you most identify with. It is not at all irresponsible or pathetic. And how in the world can you say the Presidential election is not decided by our votes? Talk about an irresponsible statement! Of course, your second paragraph gives you away, you are obviously against Obama and probably all Democrats. Your "advise" is simply laughable. No, it is irresponsible to cast a vote in a race that you have done no research on. No, your vote will not decide the presidential election. Sorry to burst your bubble. I've against corporate puppets so, yes, I'm against most Democrats and Obama. I also don't like it when people vote blindly on party lines - but hey, it's easier than being informed! In 2002 when I was elected, I won by 205 votes out of 144,000 cast. One vote per precinct here in Mecklenburg. I beat a 16 year Republican incumbant. This is a great example of the power of the voter in state and local elections, where, as I have stressed, they should be most informed (instead of blindly voting straight ticket). I wish more laws were made at the state and local level instead of Washington so that voters would have more power. It's too bad the dems support centralized government, more authority in the federal government, and more laws being written by unelected executive agencies at the national level. I strongly urge anyone who is unfamiliar with the candidates for State Treasurer to GET familiar. Janet Cowell has an excellent record and a stellar reputation for integrity. Her opponent is deeply immersed in oil businesses but not such a deep wader when it comes to issues that haven't been spelled out for him by GOP talking points. And yes, I've worked on Cowell's campaign (though not since the primary because of other obligations). I volunteered because I knew of her from having watched her on the City Council and then in the state senate. She's the real deal, an honest, intelligent and committed public servant -- a true rarity in politics. As a constituent I can say that she has done an excellent job, and is one of the smartest and friendliest people in politics. I study every race, right down to the school board and judges. If I don't know the race, or the candidate, I don't vote. If a race is uncontested, I don't vote in it, because it pisses me off. You'll find that most readers and contributors here are very well informed; possibly better than you. Peddle your stuff on Kos, you might find an audience there. And really, how many folks study the candidates and issues in down-ballot races? If only those folks voted, we'd have a few thousand votes each for council of state races. Can you tell me the issues and stances of the candidates in say, the Insurance Commissioner races? Without google and cut and paste, that is. And even fewer would voted for the judges. Really stupid post from a guy who simply wants to discourage Democratic straight-ticket voting, it appears. You really believe that you will cast the deciding vote in the presidential election? Heck, there's a better chance of Obama bringing the troops home from Iraq (which is, of course, quite slim). So, you think that it would be a bad thing if only the informed people voted? I'm discouraging straight-ticket generally. Trust me, I hate Republicans more than any of you. If it weren't for Republicans, the American people would realize how terrible the Democratic party is. So why should anyone vote? Since none of us individually can make a difference, why should anyone vote at all? Your last post is one of the most idiotic things I have ever seen. Earlier you said we should vote for downballot races where our votes can make a difference. So I guess you are saying that the Senate race or Governor might be decided by my one vote, but not President? Might as well vote for all the races you are informed about, but don't delude yourself into thinking that your vote for the president is the most important: it is the least important, statistically. More likely than not, you vote won't change the outcome in a single race. But you should still do it, since the state is gracious enough to give you some small say in your rulers. We should empower state and local government instead of the national government so that your vote means more. It's about decentralization vs. centralization of state power. Dems are for centralization - they want the federal government to be in charge of education, healthcare, business regulation, and environmental issues (despite the federal government's terrible record on all of these issues), instead of letting the voters/grassroots decide these things at the local level. Were my earlier posts deleted, by the way? You called one of our long-standing community members a Nazi. We're all in favor of diverse points of view ... but you should remember you are an invited guest in our own virtual living room. We reserve the right to uninvite anyone whose behavior becomes intolerably obnoxious. But doing so, or deleting my posts, says a lot about what you stand for. Calling someone a nazi is less offensive than suggesting that someone exercising free speech should be found guilty of treason, especially when the person you are calling a nazi is suggesting just that! I apologize. I care a lot about the preservation of free speech, and to see someone on a "progressive" blog suggest that it should be made illegal - under penalty of death - is pretty disturbing to me. I'd rather be called a nazi than to see someone say that. For the record, I didn't unpublish your obnoxious posts, someone else did. If I were you, I'd be grateful. You've been a registered user here for one day. So unless you've been lurking for months, you don't know me or what I stand for in the slightest. And if you actually do want to know, read some of the 1600 posts and tens of thousands of comments I've written over the past two years. PS I'm not going to get into the merits of different degrees of offense. But I will say that the person you criticized has been writing here a long time and receives much benefit of the doubt in my book. In any case, I extend my belated welcome. You seem to be a bright and passionate person. Just got back from early voting (voted for a Dem for President for the first time since '84, been voting third party) and the poll workers, in their instructions were telling people they needed to vote for president even if they were voting straight ticket. Great to hear from everyone about the "urban counties" being represented as far as voter instruction. However, I must admit, I have less faith that this is happening in places like Oxford or Lexington or Wilson. Because NC population is so decentralized, it does make our job a bit harder than in places like Missouri where most Dem voters are concentrated in two cities. We only permit ourselves to call people names (depending on who "ourselves" is at any given point). Oh for cryin' out loud, HOSTS, get over this "he called so and so a naaaaaame!" schtick. Holy over-reaction. It's far worse that he's simply cutting and pasting the same text over and over. Who the hell can take seriously his calling anyone a nazi? Are we that danged delicate? I don't know which "we" you're talking about, and can only speak for myself. I voiced a complaint about the tone of one particular post. The writer apologized, for which I'm grateful. It's so common. And the idea that LofT is a nazi is so utterly ridiculous that it's hard to believe anyone could be fazed. I just keep seeing that sweet little dog's face and think "nazi?" I have met LofT. Trust me - not a Nazi. The very idea. BWAHAHAHAHA!!!! This man is running as a Democrat against Neal Hunt, on of the most conservative men in the NC Senate, and a libertarian of unknown origin. I'm not sure if this man is more conservative than Hunt or not, but he certainly is lying to fuel his goals of political office, and I can't bring myself to support that. Most of the states require an absentee ballot request to be made by October 24th. You can click on this link and request your absentee ballot. Dolly please don't spam. I am deleting multiple copies of your comment except two. In addition to the fact that we don't like spam and have better things to do between now an November 4th than moderate spam and content. This action is best taken within the state rather than going to an outside source. In addition, one-stop early voting in NC reduces the need for a lot of mail-in absentee voting. The link provided is well intentioned but is not as effective getting the information from the State Board of Elections and from County Boards of Elections. The link provide generates a form letter but does not tell the user where to send it. It should go to the County Board of Elections but no addresses are given. In addition the site, after some awkward navigation, provides incorrect information about the State Board of Elections as it names Elaine Marshall, the Secretary of State, as contact person and not Gary Bartlett, the SBOE Executive Director. Any registered North Carolina voter can request an absentee ballot from his/her respective county board of elections prior to the last Tuesday before the election. That Tuesday is the 28th so requests would have to be received by Monday 27th to be received "prior".